Matthew R. Greives, M.D., F.A.C.S. A biochemistry honors graduate of Washington University in St. Louis, Dr. Matthew Greives earned his medical degree at the New York University School of Medicine in New York City. His residency in plastic and reconstructive medicine at the University of Chicago Hospital included a clinical elective learning the intricacies of ear reconstruction from Dr. Francoise Firmin of Paris, France. He completed a fellowship in pediatric and craniofacial plastic surgery at the Children’s Hospital of Pittsburgh/University of Pittsburgh Medical Center. Dr. Greives is Board Certified in Plastic Surgery. His clinical interests include cleft lip and palate care and surgery, craniosynostosis, orthognathic surgery, neonatal airway surgery, craniofacial distraction and ear reconstruction. Since he joined UTHealth in 2014, he also has served as an assistant professor in the Division of Pediatric Plastic Surgery at the University of Texas Health Science Center at Houston (UTHealth) Medical School. Author of a number of papers, journal articles and presentations, Dr. Greives’ professional recognitions include the Huggins Surgical Research Symposium: Best Clinical Presentation (2011) and the ASPS Senior Resident Conference: Best Microsurgery Paper (2012). A resident of Houston, Dr. Greives, who says he “loves languages,” is nearly fluent in French and learning Spanish. Among his other leisure activities are staying active by swimming, biking and playing volleyball, and food -- both experimenting with recipes or trying new and exciting restaurants. Dr. Greives discusses diagnosis and treatment options for the entire scope of vascular anomalies and other soft tissue tumors. Dr. Grieves discusses the prenatal aspects, as well as surgical treatments for cleft lip & palate. 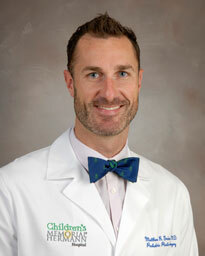 Doctor Matthew Greives discusses diagnosis and treatment options for pediatric skull deformities. In decades of collective memory at Children's Memorial Hermann Hospital, staff members couldn't think of a single other child who had taken on a project like this. With no blueprint for how to handle Tonia's donation, Dr. Grieves reached out to the marketing department. After a few weeks of back and forth, they set a date for Tonia to make her Christmas delivery. Dr. Matthew Greives and Dr. Matthew Harting worked together to help 14-year-old Alex Malgarejo who was suffering from a condition called hyperhidrosis, which caused persistent, excessive sweating in his palms.